Bixby Historical Society photographs of the downtown park, bordered by Dawes, Cabaniss and Breckenridge Streets, date to 1908. The land which was originally owned by Claude Sample and J.F. 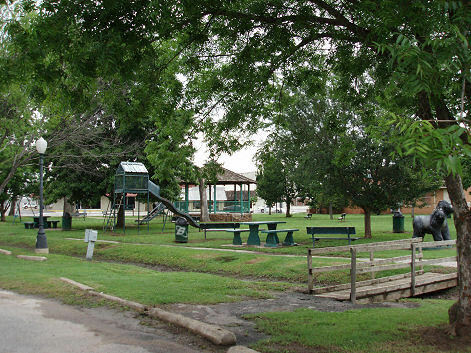 Paulter has always served as a park because of drainage problems which made it prohibitive for other uses. The park was often referred to as Pecan Park because of the numerous pecan trees on the property. The Ladies Civic League proposed, in 1917, to raise half the cost to purchase the land for use as an official park if the Town would provide the other half. The deal was made and the League began to raise funds. They held pie suppers, cake walks, box suppers and worked concessions at farm auctions & carnivals to raise money. The land was purchased through this joint effort in the 1920s. Fill-dirt was brought in to level the land and it was officially christened Bixby City Park. The League constructed tennis courts and a pavilion. Playground equipment was installed with the help of Bixby High School students and Principal Robert Rose. The frame pavilion which once staged Sunday afternoon concerts was replaced with a more sturdy rock one after World War II. The rock structure was dedicated as a World War II memorial listing Bixby’s military members. A gold star was placed next to the names of those who gave the ultimate sacrifice for our freedom. In 1972, the park was renamed, Charley Young Park, to honor the memory of Charley Young who was a leader in the park renovation prior to his death. “Charley loved the community spirit of cooperation that made the park renovation a reality,” said a family member. The Optimist Club constructed a new stage for the pavilion in 1975 and dedicated it to the memory of Grover C. Shepherd for his continued efforts at maintaining the park. Shepherd was faithful in maintaining the flower beds, lawn and playground equipment for many years. Through the years the park was the site of many special occasions including the Leonard Christmas Tree during the Great Depression, the Green Corn Festival since the late 1940s, church revivals which dating to 1908, Easter egg hunts, carnivals, Saturday visits with friends while waiting for the Merchant Drawings on Saturday afternoon during the 1950s and early 1960s. Today, Charley Young Park is the temporary home of another Bixby icon, The Bixby Memorial Flagpole.